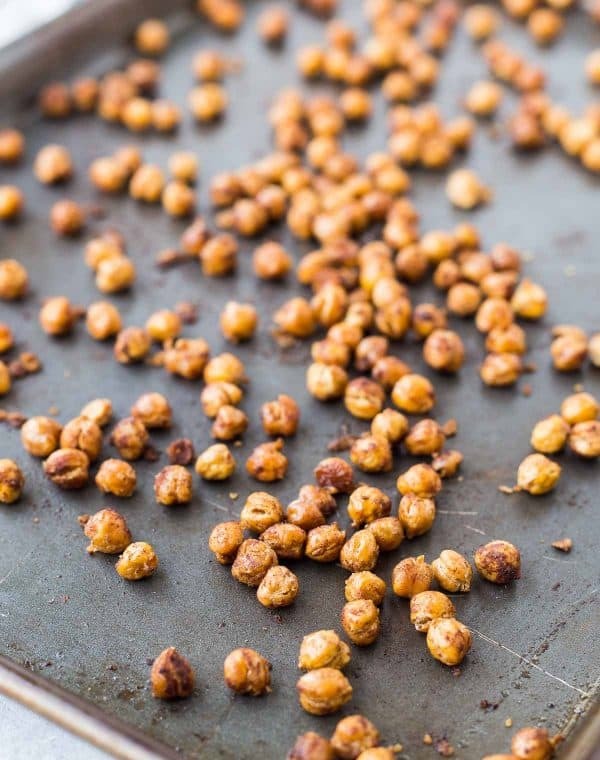 Cinnamon Roasted Chickpeas are a healthy and flavorful snack — you’ll find these are the perfect thing to crush salty and sweet cravings and keep you full! 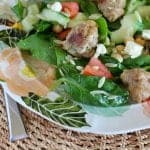 I’m always on the search for quick, easy, and healthy snacks. Of course they have to be delicious, too. You’d think in this endless quest for great snacks, I’d be better about having them with me at all times but someone how I always forget. I was in Napa Valley this past weekend which for us Michiganders involves pretty much two full days of travel. So of course I had my carry-on full of great snacks to keep me from hitting the wall. Oh wait, no, I didn’t. 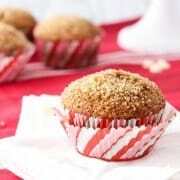 On the way out of my house, I managed to get my act together enough to grab one of the blender banana oatmeal muffins I had made for my family and a couple of clementines, but that was the extent of it. So I’m left waiting for the flight attendant to bring me peanuts. Give me all the peanuts, please. On the way home, I had time to grab a turkey sandwich at the airport which was arguably one of the worst turkey sandwiches I have ever had but I was so hungry (hangry?) that I didn’t even care. 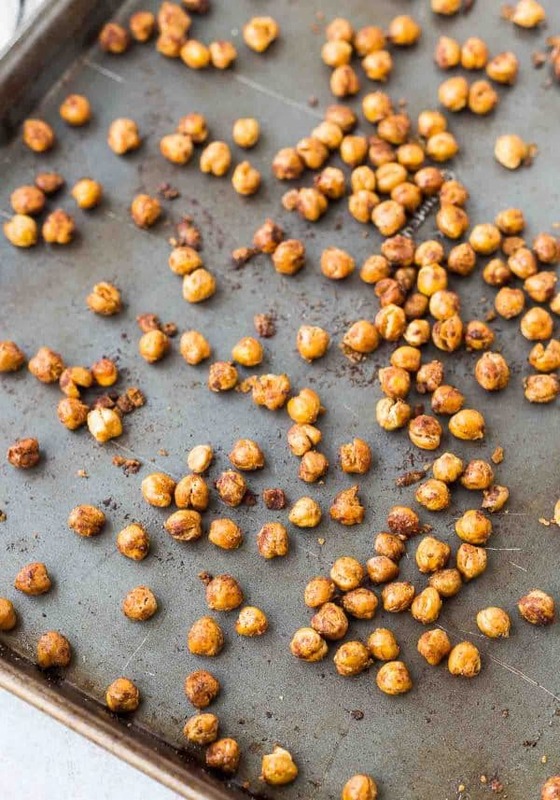 If I would have had these cinnamon roasted chickpeas, they would have been fantastically perfect for putting in my carry-on. But alas, in typical mom fashion, I had prepped a ton of food for my family and had not even taken a moment to think of myself. Good news is, I survived. 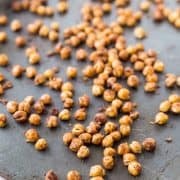 These cinnamon roasted chickpeas aren’t only perfect for travel, but they’re also perfect for families with nut allergies (like ours!). 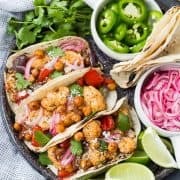 They offer the protein and crunch that’s reminiscent of a nut and they have the same ease – you can throw them in a bag, in your purse, the car, diaper bag, whatever. They’re also super simple to make and you can easily make a larger batch because they store well in an airtight container. And the flavor combinations are endless — I want to try some of the combinations I used with these pumpkin seeds. Drain and rinse chickpeas. Spread out on a towel and dry well. If you have time, let them air dry for 30 minutes. Remove any loose skins. 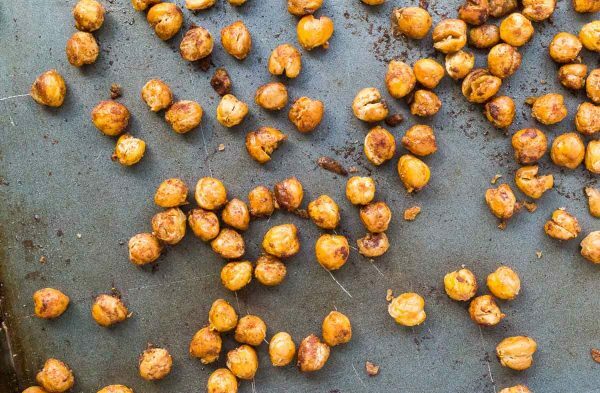 Verdict: Crunchy and satisfying — these are such a perfect snack. Husband’s take: Oh, whoops, I ate them all. Changes I would make: None are necessary! I might add a little nutmeg because it’s one of my favorites.